2015. In all, 74,509 teachers applied online. Finally 26903 Teachers took transfers as per their options. 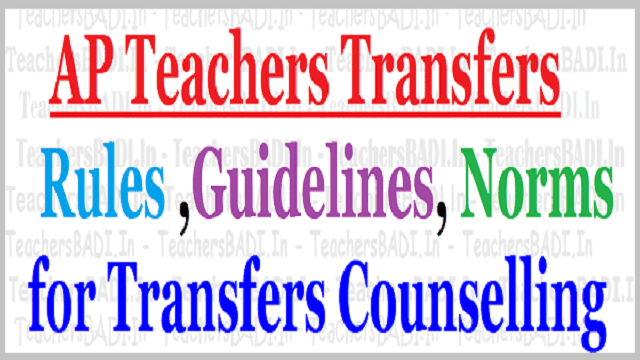 Proposals for Transfers 2017: As per the feedback from Hon'ble M.L.Cs, Teachers' Unions and Associations & individual Teachers based on web based counselling for Teacher Transfers in 2015-16, to avoid fake certification and wrong practices, as much as possible, and to utilize objectively verifiable data, certain changes are proposed for the G.O. M.S no.63, dated 31.08.2015. The revisions/modifications to GO 63, new parameters proposed with regard to the Entitlement Points, Special Points, Rationalization Points, Performance Related Points, Individual Related Performance Points and Minus Points, is attached for perusal and comments. 1. Performance Points - During the proposed 2017 Teacher Transfers, it is to inform that the number of points allocated for certain parameter is reduced/changed in order to provide 50% points for performance as directed by Hon'ble Chief Minister of Andhra Pradesh. Hence, in order to raise the overall performance points from 25% to 50%, points allocation to certain parameters had to be adjusted. For example, the number of entitlement points to the teachers working in Category II and I areas, the number of special points given to Recognized Teacher unions, Un-married female teachers, spouse points and to NCC Officers are reduced from the current 0 -10 to 3 - 4. 2. Agency areas related - G.O.Ms.3 SW (TW) Dept., Dated:10.10.2000 requires only ST candidates to be recruited I promoted to ST area posts. However, sometimes adequate number of qualified teachers do not get recruited or promoted under the category, resulting in continuing of Teacher vacancies in scheduled areas. Further, there has been a long pending request for return to Plain areas from Teachers & Head Masters who have taken transfer to Scheduled areas from Plain areas on earlier occasions. It is proposed that option may be given to such Teachers and HMs to return to plain areas It is also further proposed that where there is shortage of ST candidates, then for a short duration of tenure, junior most plain area teachers may be transferred to scheduled area schools, so as to ensure that the children do not suffer due to the vacancy of teachers in schools. In such case a maximum period of 2 or 3 years tenure may be fixed or till the regular ST teacher is recruited to the said post, whichever is earlier. Alternately where there are surplus teachers in a district, they may be deputed on work adjustment basis from the beginning of the academic year in such vacancies. 3. Objectively verifiable parameters - During transfers undertaken in 2015 based on G.O.Ms.No.63 Education (Ser.II) Department, Dated:31.08.2015, certain parameters included could not be verified with objectively collected, authentic data, especially with regard to absence I leaves availed by teachers, claiming for points with false information I declaration as to raising of funds to the schools. This resulted in submission of fake certificates by reporting officers vise HM / Mandal Educational Officer, in some instances, resulting in initiating disciplinary action.To avoid such instances, as far as possible parameters are assigned for verifiable data. collected school wise & student wise. Hence, related parameters and points are modified. 5. Increase in slabs for performance - Effort is made to recognize and give credit to the teachers who are making efforts to improve the SSC performance in their respective schools. Hence, instead of allotting points fort wo (2) slabs of performance in SSC examinations as was done in 2015, during the current year, it is proposed to provide three (3) slabs. 6. New parameters - Certain new parameters are added keeping in view the various other activities/responsibilities of teachers. For example, Prathibha Awards, MOM supervision leading to increase in the number of percentage of Mid-Day Meal (MOM) taking students, Mobilizing resources for school improvement under (BADIRUNNAM THEERUCHUKUNDAM), Conduct of PTA meetings, Maintenance of Health Cards.etc. 7. Removing redundant parameters - Some of the parameters included in G.O.Ms.No.63, Dated:31.08.2015 are proposed to be removed in view of lack of clarity in implementation and confusion caused during Transfers in 2015. For example, the parameter relating to HM I Teachers enthusiastic and having inclination to teach in English Medium Schools I Parallel Sections in schools. Physical Science Teachers willing to teach Mathematics. are being removed to adjust points for additional performance points and as they are difficult to track/verify/allocate points. 8. Minus Points: Certain minus points are proposed to encourage teachers and Headmasters who show better performance and to discourage those showing low performance or poor management. The minus points are mainly relating to those against whom punishment orders are issued or is found to show significantly very low SSC performance etc. Timeline for receipt of feedback- Hon'ble Teacher MLCs, Teacher Unions, and Associations are requested to submit their views/comments in writing with reference to specific paragraphs by5 pm on 27.3.2017 to cseap.est3@gmail.comAfter examining and considering feasibility of the feedback, necessary recommendations from CSE will be submitted to the Government on 31.3.2017. The following categories of Teachers in the Government I ZPP /MPP shall be transferred. Headmasters Gr-II who have completed 5 years of in particular school as on 30th April, 2017 shall be compulsorily transferred. (ii) (a) The male Headmaster I Teacher aged below 50 years as on 30"' April, 2017 of the year and working in Girls High School. (b) If no women Teachers are available to work in Girls High Schools, then the male Teachers who crossed 50 years of age as on 30th April, 2017 may be considered for posting to such schools. (iii) Teachers who have completed a minimum period of two years-service in a School as on 30th April, 2017 of the year shall be eligible to apply for transfer. (iv) The teachers shifted under Rationalization i.e. Primary Schools and Upper Primary Schools and in High Schools shall participate in the Transfers Counseling regardless of the period of service in the station. (v) The Headmasters Gr.II Gazetted I Teacher who have completed 5/--- years service respectively as NCC officer should be posted in a vacancy in a school where there is NCC unit. If there is no vacancy, they may be posted in a school where there is no NCC Unit. so that the NCC teacher may open a new NCC unit in the school. (vi) Preference shall be given to Head Master Gr-II, who have studied the language concerned (Urdu I Tamil I Kannada I Oriya) Language as 111 Language as main subject to the respective Medium Schools. (viii) I Visually challenged teachers are exempted from transfers. However, if such teachers desire to apply for transfer or such teacher post I person is found surplus under Rationalization they may apply for transfer counseling. (b) As per G.O.Ms.No.3 Tribal Welfare Department, Dated:10.01.2000, local tribes are to be posted in Agency areas. (c) Non Tribal Teachers working in Schools in agency area may also apply for transfers to plain area. (d) Normally as per G.O.Ms.No.3, Dated:10.01.2000, teachers working in Plain areas may not be posted to Agency Area. However, Plain Area teachers shall be posted in Agency Area on tenure basis temporarily for a maximum period of 2 years in the interest of Tribal students and for continuing instruction in the schools in Tribal Area, if there are large number of vacancies in Agency Area and for the reason that the recruitment is likely to be delayed. Such teachers shall be replaced as and when the post is filled with a tribal teacher I candidate or on completion of 2 years tenure which ever is earlier.